One of the things I miss about living in Florida is the extended growing season for fruits and veggies. Our local farmer's market starts up in a couple of weeks (so excited), but it will be at least a month after that before we start seeing any fresh local fruit. Right now, in Florida, strawberries are abundant and I miss being able to stop at a farm stand to pick up a flat for several months out of the year. We do grow strawberries here in Virginia (we even have a few plants in our garden!) but the growing season is limited to about 4 weeks starting in mid-May. During that time I make it a point to visit the closest pick-your-own patch at least twice, coming home after each trip with a giant flat of berries, a slight sunburn and a full belly. We manage to consume most of the berries we come home with while they are still fresh, but towards the end of the season I'll make a final trip to the patch to pick the few remaining berries that haven't been zapped by June's high temperatures, just to freeze for smoothies later in the summer. Strawberries you've picked and frozen yourself bear no comparison to those you buy in the freezer section of your local grocery and I will surely be freezing some again this year. 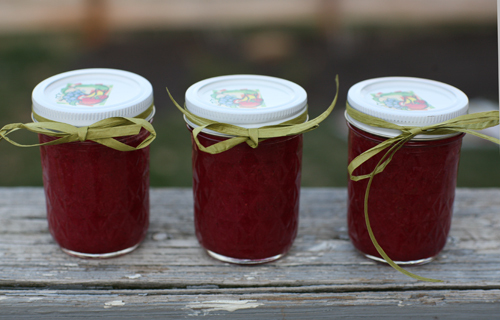 But I've also decided on another method of preservation for this May (JAM!!! ), or maybe its merely an excuse to buy even more at the patch. Because really, nothing makes me much happier than loading up a cardboard box with mounds of freshly picked berries. In the meantime I'll be making do with the fresh Florida strawberries I'm finding at Whole Foods, which are absolutely delicious even if they do lack the nostalgia that comes with picking them yourself. Canning is a new process for me, and I want to be sure to get some practice in before facing the challenge of preserving enough berries to make my fresh Virginia strawberry nostalgia last me from June 2009 until the following May. Luckily I remembered reading a Molly Wizenburg article in last June's Bon Appetit that outlined the process quite precisely, and was able to adapt her recipe to use strawberries and their favorite partner, rhubarb. The result was delicious, although I might consider reducing the sugar in my next batch so that the tartness of the rhubarb shines through a bit more. This recipe can be adapted to use an endless variety of fruit, and I plan on experimenting with as many as I can come summertime. 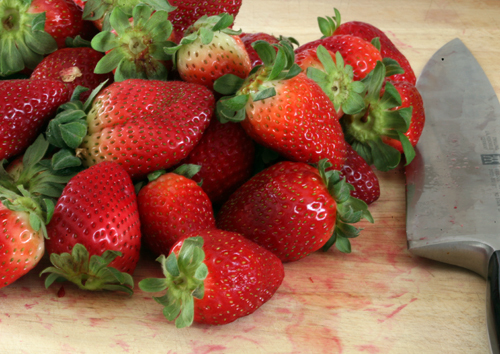 Place sliced strawberries and rhubarb in a large bowl with sugar and lemon juice. Mix to coat and let sit for 2 hours, stirring occasionally. Place 2 saucers in freezer. Transfer fruit mixture to large saucepan and bring to boil over medium-high heat, stirring occasionally. Use a hand-held mixer or immersion blender to puree the fruit as best you can. Reduce heat to medium and boil gently until mixture begins to thicken, stirring often, about 18 minutes. 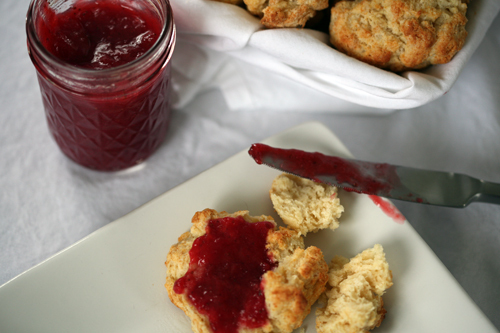 * If you'd like to preserve the jam for longer, follow Molly's method here. 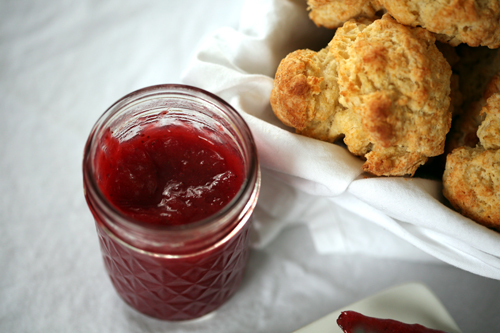 The jam will keep for months, unopened in the pantry, if you follow a proper canning method. Then, you can send a jar to friends and make them very, very happy. Thank you all for the sweet Happy Birthday messages! I had a fabulous day, or weekend actually, filled with cake (friday, saturday AND today! ), dinner out, brunch in and lots of great company. I could not have wished for more, and your messages have put it over the top. Thank you!!! Rose is giving away one of those fantastic Quaker robe and slipper sets! The deadline is midnight tonight, so hurry up! And after you enter, stick around to read more of Rose's wonderful blog and fabulous oatmeal stories...she is such a creative lady!